Hyderabad: Several mid-sized information technology (IT) firms have speeded up collecting dues and increasing the amount of advance payments in new deals on the back of volatile currency rates and uncertain business environment. “We are concerned about who will pay up and who may not," said G.V. Kumar, chief executive of Hyderabad-based Megasoft Ltd. “For our existing contracts, we are trying to re-negotiate payment terms to get advance payments and for new deals, we are trying to get a certain percentage of the deal value as upfront payment." “We are not very happy with the outstanding days’ payments and we are working on bringing in more financial discipline to bring it down from the current 80-85 days to about 72-75 days," said Rostov Ravanan, chief financial officer (CFO) of Bangalore-based MindTree Ltd. Most technology services companies deliver a certain number of days’ worth of work to a client—typically called day sales outstanding, or DSO—for which it gets payment after 30-60 days, depending on the terms of a contract. Besides the current business environment, what is worrying MindTree is currency fluctuations and how it may end in foreign exchange losses when the dues are realized. To reduce such losses, MindTree, which earns nearly 90% of its revenue in dollars, recently formed a team to speed up the collection of receivable days’ payments. Companies such as MindTree and Megasoft are also undertaking intensified risk profile monitoring of clients to figure out possible defaults or delays in payments. Another mid-sized IT company specializing in banking solutions, New Delhi-based Nucleus Software Exports Ltd, said realizing payments on time has become more important in the current environment to sustain growth and hold profit margins. “To keep uncertainty to a minimum", Nucleus Software has adopted a “proactive strategy towards collections", said Niraj Vedwa, president and head of company’s global sales and marketing. The current challenging business environment has pushed the firm to initiate a “rigorous follow-up" process to ensure “billing and collections process is in sync with the company’s goal for growth and profitability", Vedwa said. 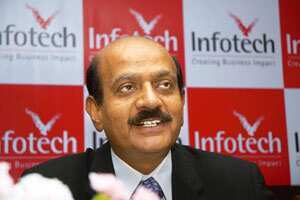 Hyderbad-based Infotech Enterprises Ltd’s chief executive B.V.R. Mohan Reddy said his company has hired an external consultant in the second quarter to figure out ways to improve collection of dues and establish a process to reduce uncertainty in receivables. “We are sensitizing our sales team about the importance of monitoring of the receivables and the need for constant follow-up," Reddy said. He also said the firm is opting for stricter terms of payment while negotiating new deals to reduce room for any uncertainty regarding payment realizations. Infotech specializes in engineering services. Ramesh Reddy, CFO of another Hyderabad-based firm, Cambridge Technology Enterprises Ltd, said his company has made it a priority to ensure there are no surprises in the expected cash inflow. “We are using this opportunity to put in place systems to ensure that at least 90% of our DSOs can be realized within the 30-day period," Ramesh said. Abhijit Ranade, associate director at audit and consultancy firm PricewaterhouseCoopers, said higher risk-profiling of clients and pre-deal due diligence by Indian IT firms are going to be the order of the day, especially where US and European clients in financial services are involved. “In such situations...any company would want to know who they are going to be working with and if the clients are creditworthy, especially where payments are going to be done after work," Ranade said. “Given that smaller IT companies who may not have huge cash reserves, it is natural that they will want to shift towards fixed-price contracts so that they can demand advance payments, which will go towards their operating income." So for now, “cash and caution is our motto for the next two quarters, till the dust settles down and there is more clarity about the future," said Megasoft’s Kumar.